Mexican drug lord Joaquin “El Chapo” Guzman has escaped from Altiplano Prison in Mexico. The escape from the maximum security prison by using a 1-mile tunnel connected to the shower area of his cell. According to the LA Times, the tunnel was nearly a mile long and deep enough for him to stand and its opening was a rectangular hole in the former prisoner’s shower, measuring 20 inches by 20 inches. It then descended 30 feet, ran its length under largely unpopulated land and ended in a somewhat isolated house under construction in the nondescript Santa Juanita neighborhood, surrounded by empty fields. The manhunt is now on for El Chapo. A massive manhunt was under way today for Mexican drug lord Joaquin “El Chapo” Guzman, who, the country’s top security official said escaped from a maximum security prison using a 1-mile tunnel connected to the shower area of his cell. The leader of the Sinaloa cartel escaped from the Altiplano prison, 55 miles west of Mexico City, shortly before 9 p.m. Saturday, said Monte Alejandro Rubido, the head of Mexico’s National Security Commission. He had been arrested in February 2014 after more than 10 years on the run. When guards noticed Guzman could no longer be seen on the prison’s surveillance system, they checked his cell and found an opening in the shower area, Rubido said. The opening led to a tunnel made of PVC pipe that had an adapted motorcycle engine likely used to transport the tools needed to drill the tunnel. Authorities immediately began searching the surrounding area and flights were suspended at the nearby Toluca airport. Rubido said 18 prison officials were transferred to Mexico City for questioning. UPDATE I: Joaquin ‘El Chapo’ Guzman’s escape a slap to the face to U.S., Mexican intelligence officials. The jail break of Joaquin “EL Chapo” Guzman, once considered the most important fugitives in the world after Osama Bin Laden, is a slap to the face to U.S. and Mexican intelligence officials and an embarrassment for President Enrique Peña Nieto. Guzman’s escape was the second in 15 years. Daily Commentary – Monday, June 29, 2015 – As of Yesterday Afternoon, the Manhunt for the 2 Escaped Prisoners is Over! 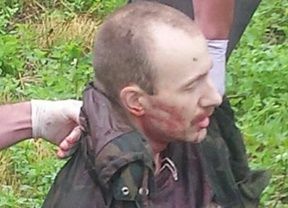 David Sweat was shot and captured alive about 5 miles from the Canadian border. Fellow escapee Richard Matt was shot and killed on June 26th. 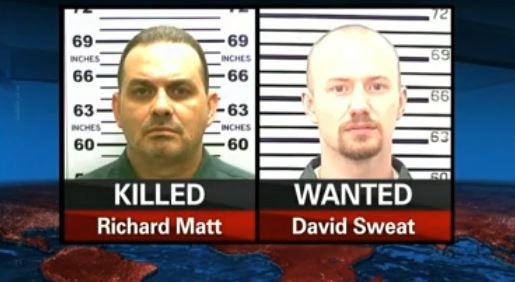 THE THREE WEEK MANHUNT IS OVER … DAVID SWEAT SHOT AND CAPTURED. David Sweat, the convicted killer who had escaped from the Clinton Correctional Facility in Dannemora, New York has been shot and captured in the upstate New York town of Constable, less than six miles from the Canadian border. In a press conference following the arrest of convicted murderer David Sweat, Gov. Andrew M. Cuomo said “The nightmare is finally over.” Sweat was shot twice in the torso by authorities and was taken to the Alice Hyde Medical Center in Malone, NY in stable condition. The shooting occurred about 3:20 PM after Sgt. Jay Cook saw a suspicious man walking down a roadway in the Town of Constable. Convicted murderer and escaped inmate David Sweat was shot near the Canadian border Sunday by a New York state police officer, according to authorities. Sweat was wounded but is alive and was taken into custody, according to the New York State Police. He was spotted by New York State Police Sgt. Jay Cook at about 3:20 p.m. in the town of Constable, less than six miles from the Canadian border, police said in a statement. Convicted murderer and prison escapee Richard Matt has been shot and killed by authorities in update New York. According to ABC News, Richard Matt was killed by a Customs and Border Protection SWAT team at about 3:45 PM in Elephant’s Head, New York, about 20 miles south of the Canadian border. Matt had a 20-gauge shotgun on him at the time of the incident. The manhunt continues for convicted murderer David Sweat. The two convicted murderers escapade from the from the Clinton Correctional Facility in Dannemora, New York with the aid of Joyce Mitchell and 57 year old prison guard Gene Palmer. Convicted murderer Richard Matt was shot and killed by authorities in upstate New York Friday, according to officials, 20 days after he made an elaborate escape from prison. Matt, armed with a 20-gauge shotgun, was shot and killed by a Customs and Border Protection SWAT team at about 3:45 p.m. in Elephant’s Head, New York, about 20 miles south of the Canadian border and just 50 miles away from Clinton Correctional Facility in Dannemora, N.Y., after he was spotted by a law enforcement officer walking in the woods. Officials said earlier Friday they had no reason to believe Matt wasn’t with fellow escapee David Sweat but he has not been sighted since his escape. 57 year old prison guard Gene Palmer has been arrested in connection with the prison escape of convicted murderers Richard Matt and David Sweat from the Clinton Correctional Facility in Dannemora, New York. Palmer was charged Wednesday with promoting prison contraband in the first degree, two counts of tampering with physical evidence, and one count of official misconduct. According to court documents, Gene Palmer is accused of accepted paintings from the two convicts in return for tools. Palmer is said to have destroyed the paintings following the prison escape. Palmer attorney stated that his client “did not know that Joyce Mitchell had conned him into giving contraband to these two individuals.” Palmer worked at the prison for 27 years. Bail was set at 50,000 bond or $25,000 cash bail. NBC News – New York Prison Guard Gene Palmer Arrested. A guard at the New York prison where two convicted killers escaped earlier this month accepted paintings from them in return for tools, according to court documents. Gene Palmer is alleged to have later destroyed the paintings — burning some of them in a fire pit at his home and burying others in woods nearby — after Richard Matt and David Sweat escaped the Clinton Correctional Facility in Dannemora on June 6. Palmer was charged Wednesday with promoting prison contraband in the first degree (a class D felony), two counts of tampering with physical evidence (a class E felony) and one count of official misconduct (a class A misdemeanor). The charges carry prison terms ranging from 15 months to seven years. The documents allege that Palmer provided a flat-head screwdriver and needle-nose pliers on “at least four separate occasions” beginning as early as November 2014. According to the complaint, this was a result of Palmer receiving paintings from the Matt and Sweat.